Though gingivitis can be easily dealt with it should never be ignored. It can lead to more serious gum disease that may not only cause tooth loss, but also threaten your overall systemic health. Before we get to the products, there are three absolutely fundamental features of gingivitis that we have summarised briefly below. Understanding these will help you more successfully treat gingivitis and avoid it in the future. What is Gingivitis and why does Gingivitis occur? Any condition ending in ‘itis’ is an inflammation. Inflammation involves reddening and swelling. Gingivitis is an inflammation of the gingiva. This is the tissue that holds teeth in their sockets and fixes them to the jawbone. Three out of four Americans will suffer from gingivitis at some time in their lives! an build up along the gum line called plaque. Why Is It Important For Gingivitis To Be Treated? If plaque’s not removed, it binds with minerals in your saliva to form tartar. Tartar is hard and sticky and builds up in areas your toothbrush can’t reach, including below the gum line. This may cause gaps to form between the teeth and gums and, since tartar harbours bacteria, the gums may then become infected. This is exactly what your body was trying to prevent by swelling the gums. And what it was trying to warn you about by making your gums bleed and feel sore. Once the gums do become infected, you may develop periodontitis which can lead to tooth loss and the spread of bacteria into your bloodstream. This in turn can then affect your general health. But take heart! This progression can easily be reversed if you take prompt action. And the toothpaste you choose can make a significant difference in stopping gingivitis in its tracks. The right toothpaste can remedy, reverse and prevent gingivitis IF you start with a clean canvas. By this we mean that if tartar has already built up along your gum line it needs to be removed. The only way to do this safely and effectively is in-office. Once the tartar is gone it’s vital to brush AND floss correctly to regularly remove plaque before it gets the chance to build up again. We provide more general advice on flossing below, but for now what should you look for in a toothpaste for gingivitis? Detoxifying ingredients that treat the gum line where plaque bacteria can build up. Ingredients that dissolve calcium contained in saliva before it calcifies into tartar. Formulations that enable the toothpaste to penetrate hard to reach places. Contains stannous fluoride to fight plaque and prevent cavities and pain from sensitivity. The key active ingredient in Parodontax is stannous fluoride which has antibacterial properties that fight plaque and gingivitis. 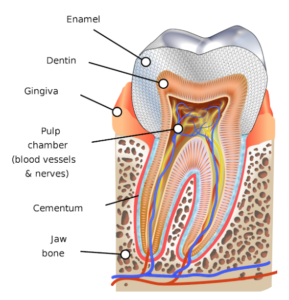 In addition, it lays down a mineral barrier over exposed dentin (inner part of the tooth) to prevent sensitivity. Parodontax has the added benefit of enabling you to continue with your whitening regime whilst improving gum health. As well as using hydrated silica to gently buff away stains, Parodontax deploys Pentasodium Triphosphate (PT) to dissolve surface stains. PT also prevents food particles from sticking to teeth surfaces which disrupts plaque build up. Polyacrylic acid is deployed as an anti tartar agent as it reduces the amount of calcium in saliva to prevent the calcification (or hardening) of plaque. This is a great daily toothpaste that supports gum health, while gently whitening and protecting your teeth. It has a thick non-gritty texture and a fresh minty flavour (view on Amazon). Crest Gum Detoxify is specifically formulated to neutralise and control plaque around the gum line. It is engineered to provide a cooling, soothing foam that reaches areas your toothbrush cannot. The active ingredient it contains, stannous fluoride, not only fights cavities, but also has antibacterial properties that fight plaque as well as laying a protective mineral barrier over the tooth surface to strengthen tooth enamel and help prevent sensitivity pain. In addition, zinc citrate is used to neutralise the ph value in the mouth and reduce harmful acids. Combined with flossing, Crest Gum Detoxify can give you clinically proven healthier gums in just two months – and prevent future gum problems before they get a chance to develop (view on Amazon). For whitening benefits you can also try Crest Gum Detoxify + Whitening Toothpaste, which combines gingivitis protection as well as noticeably whiter teeth. Lacalut Aktiv is a German product. The active ingredient it contains is aluminium lactate, an astringent which helps to tighten gums and close the ‘gaps’ that may be allowing bacterial infection. It also helps to prevent future gum inflammation. Combined with aluminum fluoride, Lacalut Aktiv has been clinically proven to reduce decay, remove plaque and clean deeply and effectively. Lacalut Aktiv also contains contains aluminum hydroxide to neutralise harmful acids in the mouth. This is a lot of aluminum related ingredients! There are some health concerns about the use of aluminum in oral products so if you share these, this may not be the toothpaste for you. Beyond the aluminum related ingredients, Lacalut Aktiv deploys Allantoin to soothe inflammation and Chlorhexidine Digluconate which has strong antiseptic properties and therefore prevents plaque build up. Lacalut Aktiv is a tingly toothpaste that will leave your mouth feeling refreshed, fight bacteria and gently treat and tighten sore gums (view on Amazon). Colgate deploys triclosan, a powerful antibacterial agent, to fight harmful plaque bacteria that cause gingivitis. The Food and Drug Administration have approved Colgate Total products but there are concerns that triclosan can have negative health impacts. If you share these concerns, Colgate Total may not be the toothpaste for you. In addition to triclosan, Colgate Total deploys Poly Maleic Acid to maximise the take up of triclosan by tooth enamel and Sodium Hydroxide to neutralise harmful plaque acids. Colgate Total Pro Gum Health has a fresh, not overbearing, minty flavour and a pleasing consistency (view on Amazon). Using the best toothpaste for gingivitis is your first line of defense against gum disease. Brush correctly at least twice a day. Increase this to after every meal if you are prone to gingivitis or have a family history of gum disease (and that’s 30% of us according to the American Academy of Periodontology). But brushing is just step one of an oral health routine that aims to protect your gums. Floss as well as brushing! Even the best toothbrush can’t get between teeth and under the gumline so you should floss once a day to treat and prevent further gingivitis. There a variety of flossing tools to choose from, including the most fun, fast and easy way to floss – a water flosser – which can help reverse gum disease. Replace your toothbrush or toothbrush head every 3 months to ensure you are always removing as much plaque as possible. Use a specialist toothbrush. Think about upgrading to an Sonicare Series 3 which promises healthier gums in just 2 weeks. Regularly check your gums: If you notice changes in color or appearance, see your dentist or dental hygienist. See your dentist twice a year for a deep clean and a general check up. If you have weakened immunity, a family history of gum disease or are at risk of gum disease due to other factors, then more regular check ups may be necessary. And lastly, eat healthily. In particular, cut down on sugary, starchy foods. Sugar encourages the growth of bacteria and the production of bacterial acids.